Cathy has travelled the world extensively following her heart’s calling and studying the science and spirituality of expanding consciousness and healing the body, mind and spirit. ‘Since 2013 I have been on a journey to understand the nature of the human experience and this has taken me to some wild and wonderful places! Including living deep in meditation in remote parts of India, spending time living alongside shaman and medicine healers and calling the Australian bush home. 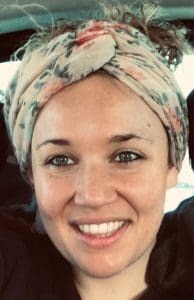 After studying PE at university Cathy trained in India as a yoga teacher in 2014 and has been sharing her craft ever since, teaching yoga and holding transformational spaces for healing. Cathy’s biggest passion is facilitating radical change in people through bodywork. She is a certified lomi lomi massage therapist, having trained with the UK Hawaiian Massage Training Centre. Cathy has trained and assisted with the International School of Temple Arts, is a graduate of Jewels Wingfield’s programme An Initiation into the Sacred Feminine, is a women’s circle facilitator, yoga nidra teacher and is currently undertaking a two-year energy healing and shamanic practitioner training alongside regular vipassana meditation courses.